When a teacher demonstrates how to do a procedural task, like a math problem, going through the sequence of steps to the solution, this is known as a worked example. Our daughter learned to play the guitar primarily from watching Youtube videos! This is a perfect example of how a novice benefits from watching how to do something and leverages their innate ability to mimic what they’ve seen to be able to acquire the skill or deepen their understanding of a concept (check out my article on observation here). In fact, worked examples, or in Montessori parlance lessons or presentations, rely on observational learning. Montessori methodology incorporates this learning technique in its lessons, which are presented by the guide to the child. They are then allowed to work with the material until they master the concept involved. While guides are demonstrating a worked example, it is important to note that they aren’t expecting pure mimicry. My friend and colleague Jon Wolff was taught by Mother Isabel Eugenie who learned and worked side-by-side with Dr. Montessori herself. 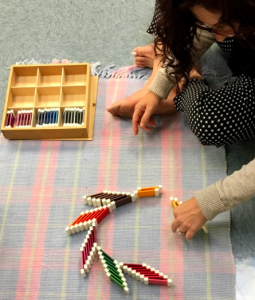 Jon reminded me the other day of Mother Isabel’s directive that we are “to give the clearest presentation of the possibility tied to to the materials, while minimizing the potential for rote memorization.” In practice, this means Montessori guides are to give a worked example that leaves space for discovery. Most recently, I had the opportunity to deepen this understanding to a group of novice guides working with children in the first plane of development. In presenting the possibilities of the sensorial area, I presented each of the materials then opened the floor to exploration. What emerged was incredible. Adult learners making their own connections with the materials after jumping beyond the worked example. Research shows worked examples better support early learning of a concept or skill, while the strategy of deliberate practice improves advanced performance skills. This being said, the act of creating a worked example isn’t enough for your learner to benefit; having a clear structure with which every step is demonstrated and isolated for difficulty is imperative! Sound familiar? That’s right, worked examples follow a clear set of characteristics much like an ideal Montessori lesson. Worked examples reduce unnecessary steps, focus the attention on the task at hand, and provide a concrete illustration of the possibilities. These techniques are quite clear in our work with first plane students, yet I have witnessed the use of worked examples as an effective technique when introducing older students to abstract concepts such as math word problems. When a worked example accompanies assigned problems, the student is far more likely to understand the concept quicker and they have a sample to lean on when they independently tackle what is expected of them. Have you analyzed your lessons to insure you are giving the minimal worked example to insure student discovery and deepened understanding?